Note: This review was published in 2009. At least one new edition of the EPD has come out since. For more details on the 17th edition, see also my comparative review where I compare it with the Longman Pronunciation Dictionary. 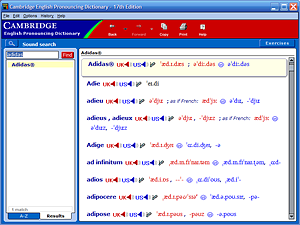 The Cambridge English Pronouncing Dictionary CD-ROM software is included with the paper version of the 17th edition of the Cambridge English Pronouncing Dictionary (you can also buy a cheaper version without the CD-ROM). Like the book version, the software contains 220,000 phonetic transcriptions of English words, including inflected forms and proper names, covering both British and American pronunciation. For more information about the transcriptions, see my review of the book version. Apart from the transcriptions, the CD-ROM version offers a few additional features. Some of them, e.g. sound recordings, are typical of a software dictionary. Others are quite novel, e.g. the Sound Search and pronunciation exercises. All the features are described below. The CD-ROM does not contain the information panels or the study section from the paper version. The setup program for the EPD offers an “install to hard drive” feature, which is absolutely necessary in every software dictionary. It lets you use the dictionary without the CD in your CD-ROM drive, so you don’t have to look for the CD when you want to look up a word. The responsiveness of the EPD is good on modern computers. On my laptop with a dual-core CPU and a 5400 rpm hard drive, the EPD starts in 2 to 4 seconds. This is of course slower than I would like — there is no reason why it couldn’t start in a split second, other than the fact that it would have taken more developer man-hours (and more money) to complete. But the EPD is no worse than other popular applications (when was the last time you installed a new version of an application and found that it’s faster than the previous one?) and certainly better than most other dictionaries on the market. Looking up words is very easy. At all times, you can simply start typing a new word and press Enter to look it up. You don’t have to delete the previously typed word or even click on the search box. If only normal dictionaries for learners were that user-friendly. The entries are easy to read. The font is very readable and you can choose from three text sizes. What’s important, the developers did not simply copy the layout from the book dictionary, which has very little space. Instead, they tried to take advantage of the large amounts of free space available on the screen. For example, the software lists full inflected forms of words (starts, starting, started, etc. ), not just the endings (-s, -ing, -ed, etc.). This may be a small thing, but it shows that the publisher gave some thought to the development of the software. The interface in the EPD is very pleasant to use. The only major complaint is that you cannot shrink the window properly — the minimum size is 800 x 600 pixels (screenshot). This makes it hard to work side-by-side with another application like SuperMemo or a word processor. The 16th edition of the EPD CD-ROM was a bit disappointing because it only had British recordings. This edition has both British and American recordings. However, you can listen only to the first (most common) British and American pronunciation. For example, even if the dictionary lists more than one British transcription (e.g. for pure: /pjʊəʳ/ and /pjɔ:ʳ/), you can only listen to the first pronunciation. You might expect top-quality audio in a specialized pronunciation dictionary, but the technical quality of the recordings in the EPD can be described as “average”. It sounds like the audio files were compressed too much. I can definitely hear some compression artifacts and sometimes a small amount of noise, especially when listening with high-quality headphones. There are certainly dictionaries with better sound quality, such as the Longman Dictionary of Contemporary English and the Collins COBUILD Advanced Learner’s English Dictionary (5th edition). Another issue to look at is whether the recordings match the phonetic transcriptions. In this area, the EPD is ahead of general dictionaries for learners. With 30.5 points out of 38 in my test, it is slightly more accurate than the Oxford Advanced Learner’s Dictionary, which has the most accurate recordings of all the learner’s dictionaries I have tested. Its British recordings are particularly accurate — in fact, almost perfect. The EPD does not have recordings for derived words, such as lifted, lifts, lifting; only the main word (lift) has been recorded. For comparison, here are the recordings from the 16th edition of the EPD, which had a lower compression ratio and better quality: aspiration, microeconomic, practicality, caricaturist, malevolence. As you can hear, the recordings are read by a few different speakers. In my opinion, the British speaker who reads the first two recordings has an especially nice pronunciation. The EPD software has a nice feature called “Sound Search” (see screenshot to the right). It lets you find all the English words that match a given pronunciation. You input the pronunciation using phonemic symbols. Wildcards are permitted — ? substitutes any single symbol and * substitutes any number of symbols (including no symbol). Search for words ending in the ɔ: vowel. If you turn on the “US only” option, the search will find words like flaw and claw. With the “UK only” option, it will also find words ending in -r like adore and poor. Search for words where the ʌ vowel is unstressed (such words are rare in English) by typing in *'??? *ʌ* and *ʌ*'*. The first string finds all words where there are at least three sounds between the stress symbol (ˈ) and ʌ. The second finds all words where the ʌ comes before the stress symbol. In both cases ʌ is unlikely to be stressed. The search has a few bugs (see the “Bugs” section below). The EPD comes with a voice recording feature, which lets you record your voice and compare it with the “official” pronunciation in the dictionary. This can be helpful, as learners sometimes think their pronunciation of a word was OK, even though it was not. They notice the difference only when they listen to a recording of their own voice. The voice recording feature allows learners to record their pronunciation many times, listen to it, and get closer and closer to the correct pronunciation. The dictionary software includes 15 pronunciation exercises for British pronunciation. In all of them, you read and listen to an English sentence and then answer a question about the sentence. 13 exercises involve identifying one of the sounds in the sentence. 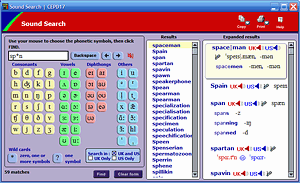 The software displays a few choices and you’re supposed to click on the right phonetic symbol. 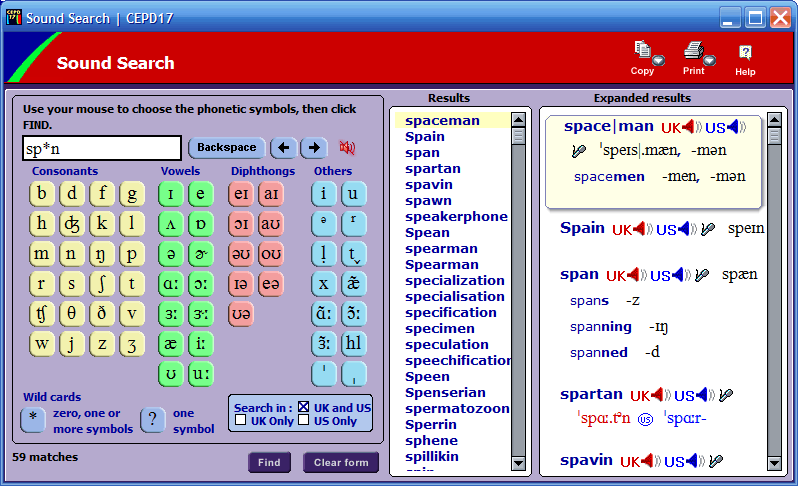 Example subjects of the exercises are: “short vowels”, “diphthongs”, “the letter ‘a’”, “the letter ‘u’”, and “words containing ‘ough’”. The other two exercises are “How many syllables?” and “Stress patterns”. In the first one, you’re supposed to determine the number of syllables in words like genealogist and miniature. In the second, you identify the stressed syllable. Each exercise contains about 50 sentences. All the recordings are spoken by the same excellent British speaker who did (in my opinion) the best recordings in the dictionary. Here are just two examples to give you an idea: example 1, example 2. I liked the exercises, because they teach beginner learners to recognize various sounds of British English and to write those sounds with phonetic symbols. Learners can also practice their British pronunciation by repeating the sentences after the speaker. You cannot move the cursor by clicking your mouse in the Sound Search text box or by using arrow keys on your keyboard. You have to use the on-screen buttons. If you try to use your keyboard, you get a nasty error message. When I searched for *tæt* in the Sound Search, the word mathematical was found. The transcription for this word does not contain tæt. The dictionary tries to open a network connection on startup. This is completely unnecessary, because it does not send or receive any data. If you have a firewall, you will get a warning every time you run this dictionary, unless you set the EPD as a trusted application. In the Sound Search, when you run a search that turns up many words (e.g. if you want to see how many English words contain the ə sound), the EPD displays the following error message: “A script on this page is causing mozilla to run slowly. If it continues to run, your computer may become unresponsive. Do you want to abort the script?” No matter what you answer, you cannot view your search results. As mentioned previously, the software does not let you resize the window to less than 800 x 600 pixels. As I wrote in my review of the book version, the Cambridge English Pronouncing Dictionary is useful in those situations where you have reasons to doubt your regular dictionary (or dictionaries). If the EPD lists a pronunciation first, it is probably the most common one. If the EPD does not list a pronunciation, it is probably quite rare. If you’re learning British pronunciation (RP), the exercises in the dictionary will help you learn the British sounds and their phonetic symbols. The dictionary will also give you easy access to British and American recordings and will let you practice imitating them with the voice recording feature. If you teach English pronunciation or you are a serious learner, you will like the Sound Search. It will let you do research on a large database of transcriptions — for example, find example words with a given sound or sounds. If you’re a teacher, you can use these examples in pronunciation exercises with your students. You can buy the Cambridge English Pronouncing Dictionary with CD-ROM from Amazon.co.uk for about $40. Note: The 18th edition came out in October 2011 (Amazon.co.uk page).